I recently rewired my Strat (which has had a humbucker in the bridge for the last five years or so, a Dimarzio AT-1 Andy Timmons model, which for the record sounds spectacular) with three singlecoils. While doing so, I tried a couple different “treble bleed” approaches for the guitar’s volume knob. A bit of background – while the purpose of the volume knob on a guitar is, as you would fairly suspect, to control the volume of the signal going into your amp, one of the side effects of it being in the circuit as is you roll the volume back, the high end seems to disappear disproportionately faster than the rest of the signal. As I understand, it’s not that the treble is actually rolling off faster than the rest of the signal, it’s just something about the circuit makes it seem like it is. The good news, however, is that it’s something that you can address fairly easily – there are a couple different approaches to do this, but the gist is that you wire the guitar to let a little bit of the treble “bleed” through the volume knob so that the volume control has a greater impact on the bass and midrange frequencies than it does on the treble. The result is that a guitar that previously got dark, wooly, and muddy as you turned down the volume instead stays clear. 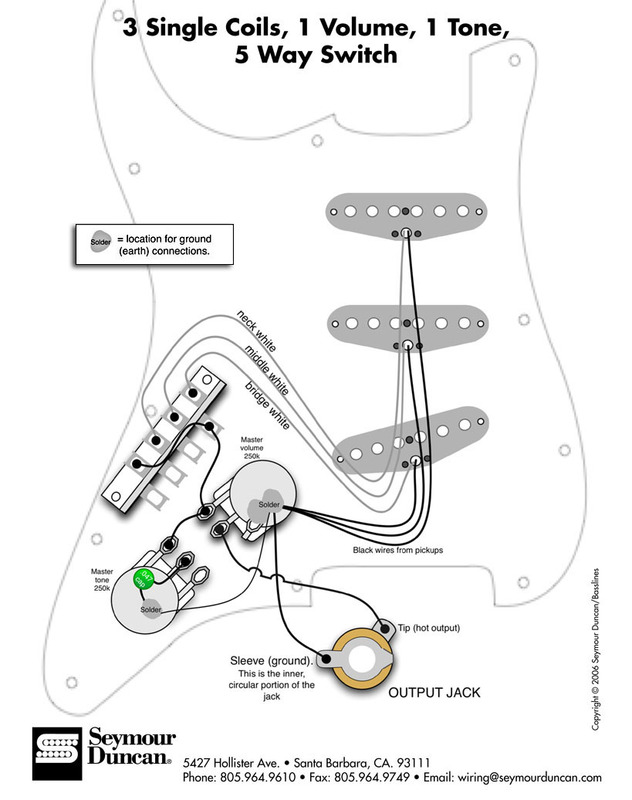 This diagram however doesn’t have a treble bleed circuit – the signal coming from the pickup selector hits the left lug on the volume knob, and then exits the center lug to the output. The traditional treble bleed circuit, meanwhile, adds a capacitor and a resistor that connects the left and center lugs, allowing a little bit of the signal to bleed through uninterrupted. This felt much more natural to me. I think there’s a couple reasons for this. Doing some reading on the internet, many people find the capacitor too pronounced as it is, and add a resistor in parallel with it to “take the edge” off the brightness a bit. For me, that wasn’t what I was looking for at all – I wanted my guitar’s high end to stay just as crisp at four or five as it was at ten. Second, talking to a friend of mine at Fender who was an excellent sanity check through this whole process for wiring diagrams and choosing values and the like, typically Ibanez has used a capacitor on the volume as a treble bleed circuit without a resistor, and while my Strat was my first love, for most of my career as a guitarist I’ve spent part or all of my time playing various Ibanez guitars. This has probably shaped how I expect a volume knob to respond. Probably most importantly, though, it also works well for what I want the volume knob to do. While I don’t play with much gain by shred or metal standards, I definitely use a fair amount of gain into a fairly dark amp, and I’m using my volume knob to control the level of preamp saturation, and not the volume coming out of my amp. Through a clean amp, either the 50’s wiring approach or the cap + resistor approach would likely have sounded great (and, really, I might not have even needed something to deal with treble). Through a brighter, edgier amp – say, a JCM800 – the slightly rounded off high end with a resistor in the circuit might have sounded great (and, listening back to the video footage, it’s not a bad sound by any means – a little muted, but kind of a “classic” sound to it, which for some reason makes me think of David Gilmour). It’s just, it doesn’t really clean up as you lower your volume – I like an amp to clean up to a gritty clean sound – think SRV plays “Little Wing” – as you roll back your volume, and I never really got there. Taking the resistor out of the circuit however let a little more treble come through, keeping the signal clearer sounding and preserving that gritty shimmer to the guitar tone – for me, for this guitar and with my Mesa, it was the best way to preserve the clarity of the high end while allowing me to control the perceived gain level coming out of the amp from my guitar. 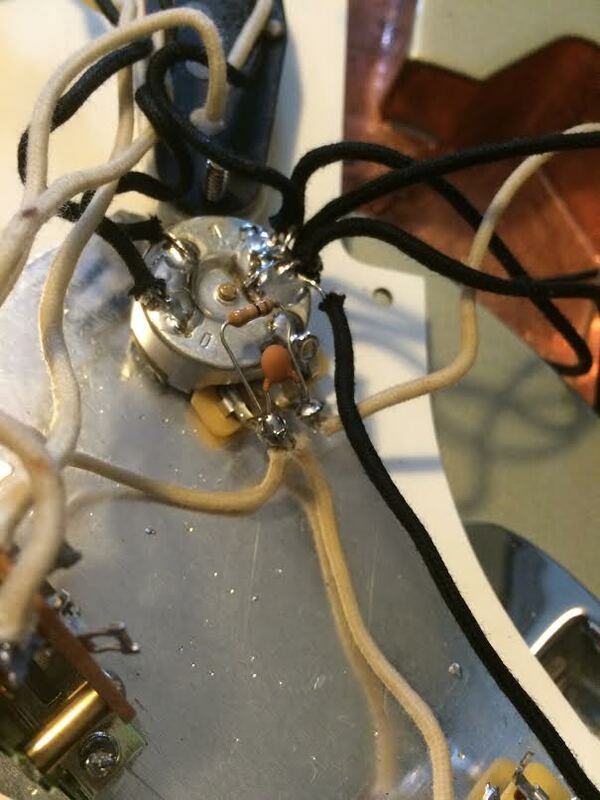 It’s definitely possible to use a capacitor and a resistor to get a similar effect – I have absolutely no idea what’s going on with the wiring in my Suhr Standard (and, it looks like it’s using a pair of resistors, and no cap…?) but it cleans up beautifully as I roll back the volume. So maybe down the road I’ll pick up a bunch of capacitors and resistors of different values and kill an afternoon trying them all, but for now I’m pretty happy with the way this is working. Here’s the video comparison I filmed while working – the third segment, where I’d removed the capacitor, then flipped over to Channel 4 on my Roadster (which I generally use for rhythm) instead of the Channel 3 I’d used for the comparison, is pretty ridiculous. The opening clean tone in the third section could be at home on a southern rock album. It’s hilarious. I see where you’re coming from, Drew. You use the cap only as a boost, to get the grit when volume is up. The resistor would make it even out. I find that on a Strat there is usually a bit of grit in the high end i like to get rid of, especially with low value ’57 pickups which are brighter to begin with, and played through Fender type amps. I also suspect that dirt pedal interaction might be quite pronounced when using just a cap and pedals usually give too much high end dirt imo. Something to consider when setting up your volume treble bleed system..
It’s not really functioning as a boost, actually… With the volume all the way up, the capacitor is completely out of the circuit, so it has no impact on the tone. As you roll the volume down, however, what the capacitor does is essentially make the volume roll-off less effective on the treble frequencies than it is on the midrange and bass ones, to mitigate the perceived effect of the treble rolling off faster than the rest of the frequencies. 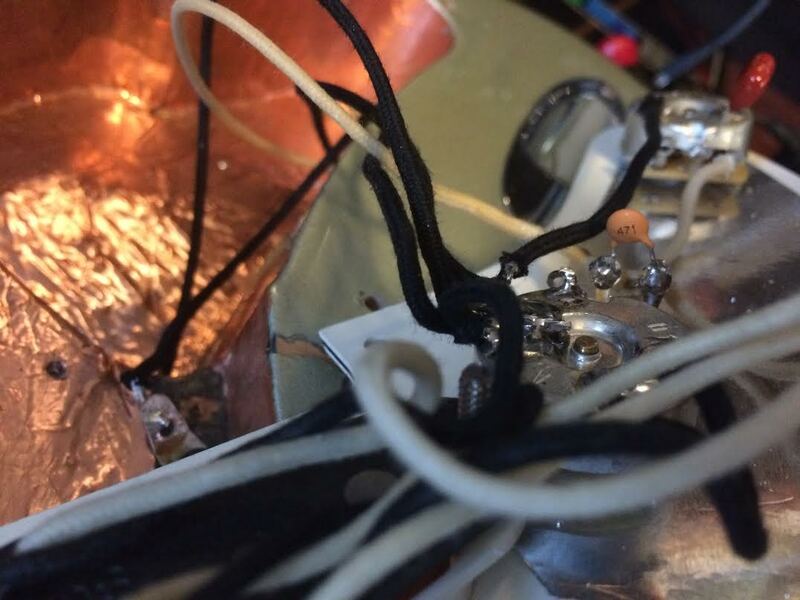 There’s no preamp to boost frequencies – I guess you could argue that the capacitor is “boosting” the treble frequencies here by letting a small amount of the treble frequencies “bleed” through, and bypass the volume roll-off, but it’s entirely passive; it’s not boosting so much as selectively bypassing a cut. All the resistor does is make the capacitor a little less effective in that selective bypass, and to my ears I found I didn’t like the impact on the tone as much. Any grit you’re hearing here is just coming from the amp – I’ve never really loved perfectly pristine clean sounds, and I prefer them with the hint of edge and breakup to them, especially on a Strat.